Holiday events are in full swing on this third weekend of Advent. There’s still retail events if you’ve missed out on some markets, displays and shows, and plenty of activities to enjoy the great outdoors as the snow is definitely here to stay. Here’s some of what’s happening this weekend. If you wish to add anything, comment below. We have all heard the news of how the 102 bridge replacement delays have caused much hardship to the surviving businesses on High Street and 124 Street. Saturday is the 124 Street Cash Mob, which also took place last year. In an effort to keep these businesses alive until the bridge is complete, citizens are encouraged to come to this to ‘mob’ retailers with cash as they do their Christmas shopping. Enjoy the lights put up from All Is Bright as well. I propose also to build a two way zip line across Groat Ravine until the bridge is open. That would undoubtedly draw people to the area. Bringing temporary landmarks to long-term construction areas may even be an option for other business impacting projects in the future. Remember the crane dance during Nuit Blanche? There’s a lot of creative ways to create temporary landmarks. If you think it’s a crazy idea to have a zip line in winter, think again. We’ve had a zip line across Churchill Square before. Updated: Photos from opening night | Photos from date night with The Red Piano. The Festival of Light can be a bit of a zoo at times. The third annual festival returns to the Valley Zoo with all new light installations for visitors to enjoy. It’s a rare opportunity in the year to see the nocturnal animals come out of their burrows and into the cold. See the video on last year’s Festival of Light with Lucy the elephant below. A video of the 2013 Festival of Light is also available here. Admission is $7.50 for adults and $5 for children. This is a special event, so annual passes are not applicable for it. It is open the same hours daily between Dec 4-13, but special programming is scheduled on the weekends. Remember to hashtag your Instagram photos with #yegfun to enter the City of Edmonton Attractions contest. During the fall and winter, public transit is not available to get to the zoo. If transit is your only choice, the closest option is via the traffic circle at the top of Buena Vista Drive and walk down. 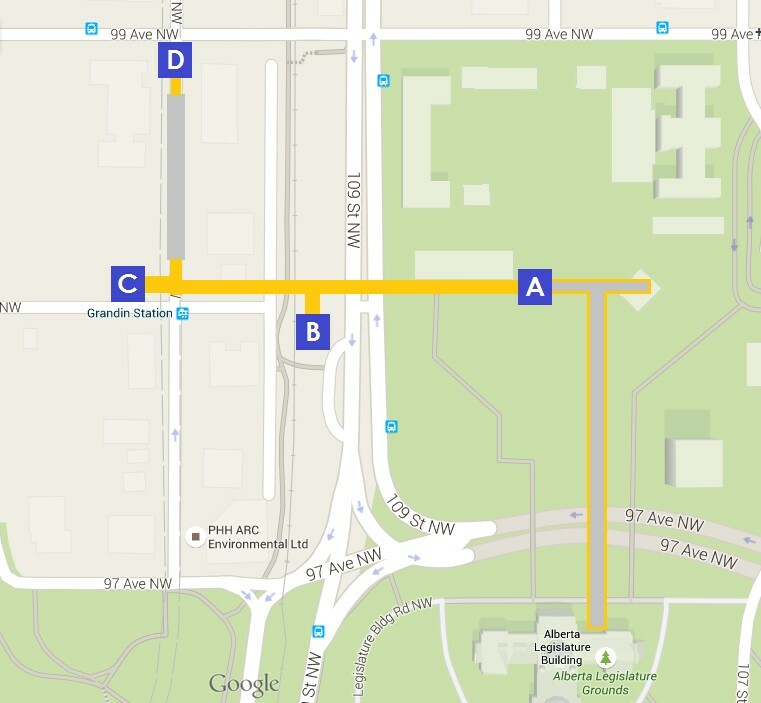 An alternative option with less climbing effort is from South Campus station: take a bus and alight before the Talus Dome on Fox Drive, then cross Quesnell Bridge and follow the trail east. Edmonton’s beloved Candy Cane Lane is now open for the season until January 3, so after visiting the Valley Zoo Festival of Light, head up the hill to Candy Cane Lane nearby (148st from 92av to 100av). Next weekend (Dec 17-19), enjoy an exhibition of nativity scenes, hot chocolate, and kids crafts on the north end of Candy Cane lane at West Edmonton Christian Reformed Church. The street is lit by private home owners and is not subsidized by the City of Edmonton nor the utility company. Yegventures recommends a fuller experience by walking instead of driving through the neighbourhood. And remember to bring a Food Bank donation which is accepted anywhere along Candy Cane Lane. More information here. 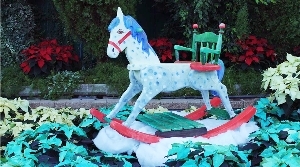 The Muttart Conservatory’s last show of the year is always their Christmas show. The theme this year is ‘Snow Flakes Are Falling’, and runs from November 21 until January 3, 2016. Poinsettias are lined from wall to wall in their send off into the New Year. On Dec 13, you’ll get to plant a Christmas cactus on Snowflake Sunday at Muttart Conservatory as the event to celebrate the current feature show. Santa’s Little Helpers will also be there for face painting. The long-awaited pavilion at Victoria Park is set to open Saturday. It’s located by the skating oval and serves as a multi-function building, located at 12130 River Valley Road. Grand opening events run from 1-3 pm. Park at Victoria Golf Course or take the trails from Grant Notley Park. Councillor Ben Henderson, Edmonton-Centre MLA David Shepherd and Jules Chabot, President of the Edmonton Speed Skating Association, will be dignitaries at the opening. Wagon rides will be available to take people from the parking lot to the pavilion 12:30 to 3:30pm. Bring your skates if you’d like to skate at the oval. Since the ‘advent’ of social media, it seems like there is something going on at Prairie Gardens all year round. Enjoy a rustic family celebration with Santa and Mrs Claus, decorate cookies with elves, and ride their magical Polar Express. Don’t miss the light up of the most extensive Christmas light display in the city located at the Alberta Legislative Assembly grounds. While you’ll see the most pictures of this building in the summer with weddings and graduations, the winter is full of light and colour. Celebrate The Season is a 3 week long festivity (Dec 3-23) at the Alberta Legislature featuring daily performances by choirs across the province, complimentary hot chocolate and treats, all through the reopened front entrance of the 1912 building. The lights will turn off January 3rd. To support the Rotary Club’s Christmas drive, Old Strathcona will be rolling in ride-by-donation sleigh rides on Saturdays in December. From 1-5pm on December 5, 12, and 19, the sleigh ride route will have 4 stops in the Old Strathcona business district. Click on the image to view the full-sized map. Remember to take a picture of merchandise or places and Tweet or Instagram #WhyteWishes while you shop. You may win the item you’re posting until December 15. A Magna Carta from Durham Cathedral is at its last stop at the Alberta Legislature’s Edmonton Federal Building. It is the first time it has left the Cathedral as part of the 800th anniversary of the first Magna Carta. Accompanying Magna Carta on display is one of only three existing copies of the Charter of The Forest. The exhibit ends December 29 and will return to Durham after that. A Yegventures story on the exhibit will be available soon. To get here, take exit A at Grandin station and follow the signs to Magna Carta which should direct you to the pedway on the left, before the ramp to the viewing area.